We’re Getting Ready for The Composites and Advanced Materials Expo (CAMX)! See You Soon in Orlando! 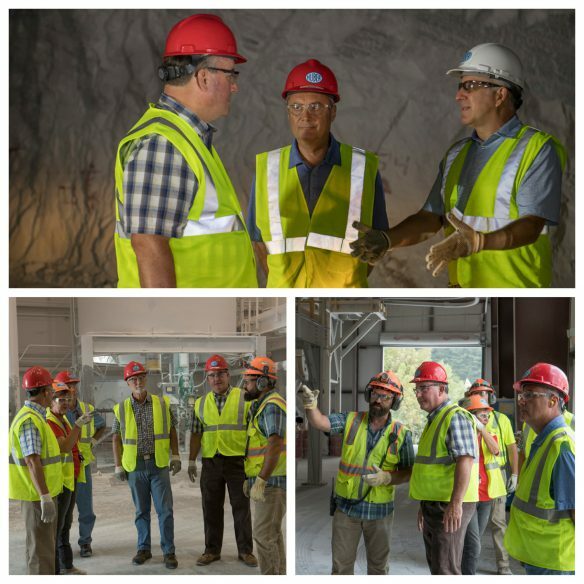 In the top photo, Georgia State Senator Frank Ginn (left) listens intently as Matt O’Brien (right), Vice President and General Manager of Huber’s Ground Calcium Carbonate (GCC) business, explains how we mine calcium carbonate underground at our Marble Hill, Georgia operation as Huber’s Lane Shaw (middle), Technology and Business Development Director for GCC, looks on. In the left photo immediately above, Heleen Murphy (second from left), Marble Hill Production Manager, gives an overview of Marble Hill’s manufacturing processes to (from left) John Phillips, County Engineer for Georgia’s Franklin County; Lane Shaw; Phil Munro, County Engineer for Georgia’s Madison County; Senator Ginn; and Jason Ellis, Marble Hill Plant Manager. In the right photo immediately above, Jason Ellis points out a key calcium carbonate manufacturing technique to Senator Ginn during the tour. It was our distinct pleasure July 27 to welcome Georgia State Senator Frank Ginn to our Marble Hill, Georgia, Ground Calcium Carbonate (GCC) mining and manufacturing facility. Sen. Ginn, a friend of the Georgia Mining Industries, visited our Marble Hill underground mine and plant for a comprehensive tour of the operation to gain a better understanding of how we mine and produce our array of industrial GCC products. Sen. Ginn was accompanied on his visit by Lee Lemke, Executive Director of the Georgia Mining Association; John Phillips, County Engineer for Georgia’s Franklin County; and Phil Munro, County Engineer for Georgia’s Madison County. Huber personnel directing the tour included Matt O’Brien, Vice President and General Manager of Huber’s GCC business; Lane Shaw, Director of Technology and Business Development for GCC; Jason Ellis, Marble Hill Plant Manager; and Heleen Murphy, Marble Hill Production Manager. Following an introductory meeting that included historical information about the site and what the visitors would see as they toured the mine and manufacturing areas, the group received an important safety demonstration and presentation so they were prepared to safely walk around the operation. The tour was comprised of a visit underground to get an up-close look at how Huber mines the GCC we ultimately bring out of the mine to process at our manufacturing operation. As the guests toured the manufacturing and processing areas, they were able to see firsthand our recent capacity expansion at Marble Mill which resulted in Huber continuing to support its customers’ growth strategies with increased capacity for both medium fine and fine GCC products.